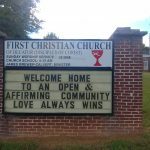 First Christian Church in Decatur GA is proud to proclaim its Open & Affirming welcome! I walked into the two-year-old room to find the new substitute monitoring a Mothers’ Day card-making project. As I took my seat to watch what was going on, Elsie finished up a card, and reached for another. “Elsie,” said the substitute, “we’re only making cards for our moms today. You can get some of the drawing paper if you still want to draw.” Hmm, I wondered how this would play out. I doubted that Elsie would succumb to the sub’s suggestion. “I have two moms,” announced Elsie. “No, you don’t,” replied the teacher. Uh oh, I thought, she’s going to argue with a two-year-old. It’s never a good idea to get in a power struggle with a two-year-old. You will lose. “No, Elsie, people only have one mom…” continued the substitute. Much of bigotry, whether it is in classes, pop culture, or our churches is the result of inaccurate expectations. In our humanity, we create images of others. These expectations of those around us serve as the template for what we consider normal. The substitute teacher who argued with the two-year-old had a template in her head for families. A family with two moms was outside that image. When we talked about this event afterwards, the substitute teacher apologized. “I just didn’t know,” she explained. She expected that all children are raised in homes by a man and a woman, by a single mother, by grandparents, or even by a single father. Her expectations were inaccurate and limited. We do the same thing in our churches. We expect that with the right mixture of worship experience, children’s ministry, and mission to the community we will attract families from the church of our memories. We wrongly expect not only stone buildings filled to the brim with people, we expect those people to look like a collection of television show families from the middle of the last century. Our image of the church is filtered through memories that are not wholly accurate. We expect that we can create that which never existed. We strive to create alone what can only be co-created with God. When we prayerfully listen and follow God, we can co-create that which God continues to transform and create. However, we too often cling stubbornly to our deformed expectations of the church and one another. We perversely draw lines within humanity of who is worthy to be included and who is not quite human enough to receive God’s love. But God doesn’t give up on us. The Holy Spirit, despite our flawed expectations, sometimes lures someone through our doors. If they don’t look like our expectations, we use the lines we’ve drawn within humanity, to collectively chase them away. This is particularly true if the people don’t meet our expectations of gender or sexual orientation. Despite the unfolding of God’s Realm of love, in which the Imago Dei (image of God) of GLBTQAI peoples is fully accepted, we see a threat. We hide behind a misinterpretation of the scriptures because others do not fit our image of humanity. We use our Holy Book to chase people away from the church. We put a stumbling block before others to keep them away from Jesus! Instead of seeing the love that the two-year-old experiences from her two mothers, we cling desperately to our image of where parental love can emanate. Instead of seeing the truth in our scriptures, that of an ever-widening circle of God’s extravagant love, we desperately cling to our expectations.